Since I haven’t updated the blog in ages you may or may not be aware that I recently moved into a Foyer de jeunes travaillers (young workers’ residence) in Pau, France, a medium-sized city about 50 km from where I teach. The foyer has collective dinners during the week and last week, the residents asked me if I could lead them in making a typical American dinner, which we did tonight. I found recipes, translated them into French, then went grocery shopping with one of the animateurs (youth coordinators). After that, everyone chipped in to help cook. It took a couple hours but with about twelve people helping everything got done! 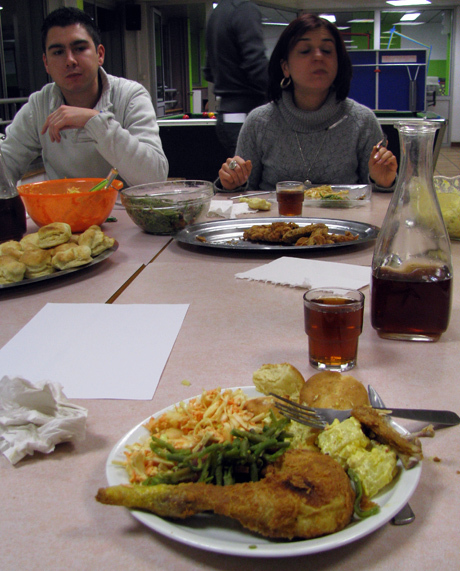 The menu: Fried chicken, potato salad, cole slaw, green beans, and biscuits. I went with a fairly Southern meal; I’d thought about trying barbecue, in fact, but decided fried chicken would be more practical, at least at first. To drink we made good old-fashioned Southern sweet tea. In the end, surprisingly (given my cooking abilities) everything turned out very well. The French people were excited to find out that American food is more than just hamburgers and fries. For dessert, the French people were adamant that they wanted pancakes, although I tried to explain that they would be better as a breakfast. Eventually I succumbed to the pressure. 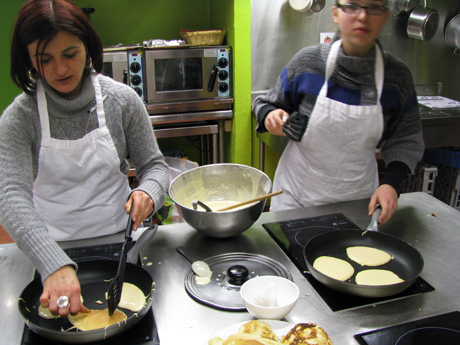 Florian made the batter and Séverine and Cécile cooked the pancakes and I must say they turned out quite well. We had them with maple syrup (quite exotic in France), apple sauce, and bananas. Et voilà! Doing my part to fatten the French up. In the end, although I’ve never cooked most of those things before, we pulled it all off, and it was a great feeling to be able to share a little bit of my culture.